Lingerie sewing is so addictive!! Once I get the fit down of a particular bra or undies pattern, I want to make 4,647 of each of them. I sewed up my first bra a few years back and my lingerie sewing stash has multiplied like bunnies since. I've picked up a bunch of stretch meshes and stretch laces from Fabric Mart in recent months, I never need to order more than one yard at a time because these projects take itty bitty bits of material. My bra is Orange Lingerie's Marlborough pattern. It's approximately a 38B... I say approximately because the pattern is altered for my figure. I've sewn up lots of Orange Lingerie bras before, this was my first go with her undies. You can see my complete journey fitting and sewing up the Marlborough bra from day one-- it started a little over a year ago when the pattern was first released. The gorgeous stretch floral mesh is a Maggy London nylon/spandex I picked up this summer from Fabric Mart. I paired it up with a luscious purple nylon/spandex galloon lace I had in my stash. The elastics and findings are all from my stash as well, each purchased over time from various shops online. I used a white nylon/lycra mesh knit from Fabric Mart... but I hand dyed it to a slight off- white because it was just too stark against the floral mesh. I also dyed the underwire channel. I made up a very, very weak dye bath of about 1 gallon of water about a couple tablespoons of RIT dye in Sunshine Orange and swished around the mesh and wire channeling around for a matter of seconds. I did pre-wet the material make sure the dye job would soak up evenly. In the left picture above you can see the faint contrast between a true white material and the newly dyed power mesh. The picture on the right there is after the dye job and drying. Not drastic, just a mild change. I completely forgot to dye the hooks on back and was too lazy to, so that is pretty bright white still. (I like to dye my lingerie materials!! You can see more details on other fabrics I've dyed for previous unmentionables on here my blog.) Now check out my secret layer of fabric below! I inserted a secret layer of a non-stretch nylon in between the floral and white meshes for my bra. I take a large square of each fabric, enough to cut out all my pattern pieces from and use a spray adhesive to stick them together. Layer 1: the floral mesh, Layer 2: the non-stretch nylon, Layer 3: the stretch power mesh. Once the big pieces are all temporarily glued together, I cut out each pattern piece. Of course the bands need to stretch, so I skipped the non-stretch nylon for those pieces. These undies are sooooo pretty! They feel so high end with all the pretty meshes and laces!!! I used the Orange Lingerie Montgomery Brief pattern. I cut a size large waist and graded up to the XL for my bum. What's neat about these are the lack of elastic on the back leg, no VPL! It's two layers of stretch mesh and lace from Fabric Mart. The pretty pink ones I used a poly/spandex stretch lace I got from Fabric Mart a while back, but are so other yummy stretch laces found on their site here. I used scraps of white cotton jersey for the crotch liner bit. I LOVE my new dainty lady things! It's so much fun to sew this stuff up because they are pretty quick to come together. Once I get the right fit with the right pattern for my figure, it's glorious to know that I have the power to make my own high quality lingerie. I'm excited to get back to our regularly scheduled blog posts. We have a few new sewers around the blog. I will be introducing them all very soon, but wanted to introduce you to our winner in the Fabricista Fashion Challenge -- Elizabeth! I'm excited to have you on board and creating together. I am so excited to be a Fabric Mart Fabricista for the next 6 months and would love to share a bit about my sewing journey! I was first introduced to sewing as a young child when visiting my grandparents deep in the coastal swamps of South Carolina. My grandparents lived off of a dirt road in a teeny township so I was bored, naturally. My mother suggested I learn to sew clothes for my many Barbie's and she taught me the basics using her own vintage Barbie clothes patterns. I loved the idea that I could dream up an outfit for my doll and make it come to life. In recent years I recently rediscovered all the clothes I made for my Barbie's during that season of life and I was prolific. I especially loved embellishing their clothes with bugle beads and fringe. I still love to embellish my garments but with less bugle beads and more piping and contrasting fabrics. As I grew too old to play with Barbies I also quit sewing until the year before I had my first child when a dear friend reintroduced me to sewing. When I made the decision to stay home with my first child I quickly realized that parenthood is full of cyclical activities that seem to go on and on, including diapers, baths, meals, cleaning up a bazillion small toys. Sewing became my therapy, it was the one thing that stayed done at the end of the day and it gave me that feeling of doing something to restore my being. Another way that sewing is therapeutic for me is in relationship to my job- which I've recently returned to part time after more than 6 years staying at home with my children. I work in the field of hospice (end of life care) as a chaplain and bereavement coordinator. It is a deep privilege to journey with people at the closing of their lives and I am so grateful that people allow me to walk alongside them during that sacred time. To sustain my work/life balance- I sew. My yoga instructor has said, "let your motion be your meditation" and I feel that with sewing- cutting fabric, pinning fabric, feeding it through the machine, ironing it, those are my motions that evolve into meditation. It's restorative to me. I am thrilled to be able to share my creations with the readers of Fabric Mart Fabricista blog since I have found that half of the fun of the online sewing community is seeing other's creations and sharing my own. It excites me to see others who share in my sewing geekery- to find others who are equally excited about seeing several people take the same pattern and all achieve a different look, or figuring out a new fitting trick/tip, and perusing fabrics and patterns. I don't have a lot of friends who sew, let alone sew their own clothes, so it's wonderful to get to know others with a similar passion even if they are half a country away. My friend, Hanni (whom I do indeed live half a country away from), and I originally began our blog I Sew, You Sew in order to share our projects with one another and others. Hanni is soon to have her second child so she is on a bit of a sewing hiatus but I'm sure she'll get the itch to create soon. My hope is that as I share my projects with you, you will find encouragement to continue your own sewing obsession! If you are like me there are always more sewing ideas (and patterns) crashing around in your head than is humanly possible to complete and I hope that as I work on my projects you will share with me your own. Sharing projects with one another not only inspires, but often elevates my sewing skills since I am always learning something new about this craft from others who are more experienced. This is going to be a fun time! So let's keep our sewing obsessive minds going, our sewing machines whirring, and our scissors sharp and ready! Sewing with wool has been on my bucket list forever. To be specific, a wool cape, a winter coat and a french jacket. I wanted something unique so I chose a vintage pattern. I wanted a superior fabric and I wanted to work with 100% wool. I picked a camel/taupe brushed wool that was such a pleasure to work with. On my version I only used two buttons as opposed to four. I also eliminated the waist tie and styled the cape with a leather belt instead. This is a big cape, so to create a good proportion, I used a wide belt. Here is side view and back view. The fabric drapes beautifully! The cape looks different when worn without a belt and I like that look too! I am simply in love with the sleeves and they make me feel like a butterfly! I chose a floral lining. Isn't it adorable? I learned a good bit about working with wool. I had it pre-shrinked by sending it to the cleaners. I learned that is takes special care to avoid overpressing and shine. I also mastered the art of perfect top stitching! What a joy..This project required more work, but the end result was so worth it.. This cape will be in my wardrobe for a long time.. 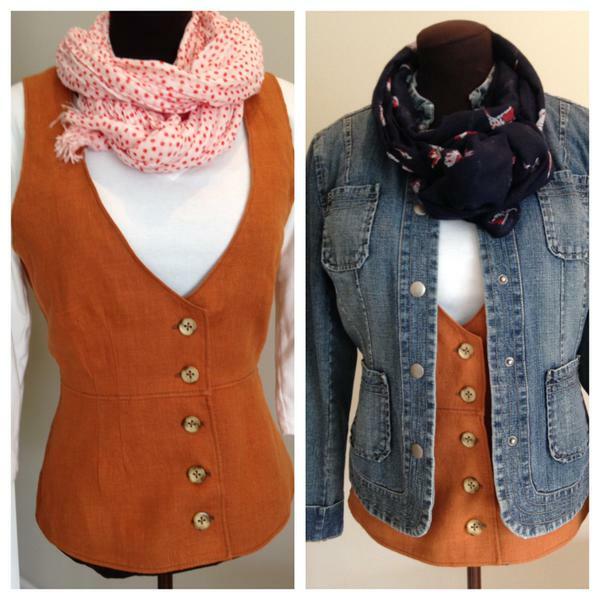 The votes are in and we have a winner in the Fabricista Fashion Challenge! This was SOOOOOO hard. I wish I could have all of them! Congratulations to....Elizabeth from I Sew, You Sew! 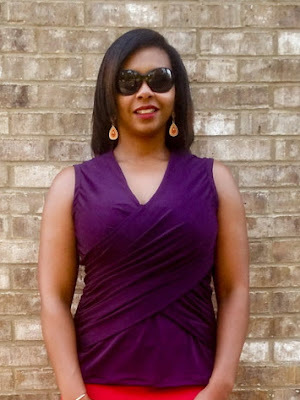 Elizabeth is the winner of $25 a month for one year to spend on fabric, plus be a Fabric Mart Fabricista for 6 months writing guest posts for the blog. (A $300 value with media exposure.) She will also receive a Julie's Picks Membership. Tiffany is second place and wins a $100 gift certificate and a Julie's Picks membership. Kristen is third place and wins a $50 gift certificate and a Julie's Picks membership. Tiffany and Kristen did an amazing job as well and it was so hard to make final decisions! Don't worry, I don't think this will be the last you see of these ladies. I'm working on the blog schedule and hope to have some newcomers lined up for the new year. If you would like to consider blogging with us occasionally, please email me at fabricmartblog@gmail.com for more information. We'd love to have you! Thanks goes out to all the contestants that participated in the third year of the Fashion Challenge. I always look forward to doing this and being inspired by everyone. Thanks to all the "celebrity judges" for helping to judge all of these talented ladies projects. It is a TOUGH job! Thanks to all the readers for participating at home and for all that watched from the sidelines. We do this for you and we're so glad you enjoy it. And speaking of our readers...we need to select a winner in the Reader Participation section of the blog: Congratulations to Nikkee H! She wins a notion prize pack! She also included a little information about the projects. ~My hardly worn item was a simple blue v neck tshirt. I don't really own much in the blue color family, besides a pair of jeans which I felt made me too blue. So I whipped up a pair of black slacks, self drafted, whether with this shirt or not these pants will see a lot of wear. They are comfortable and I like how they look. The second item I made was a sweater. I made this one with an extremely modified mccalls pattern. 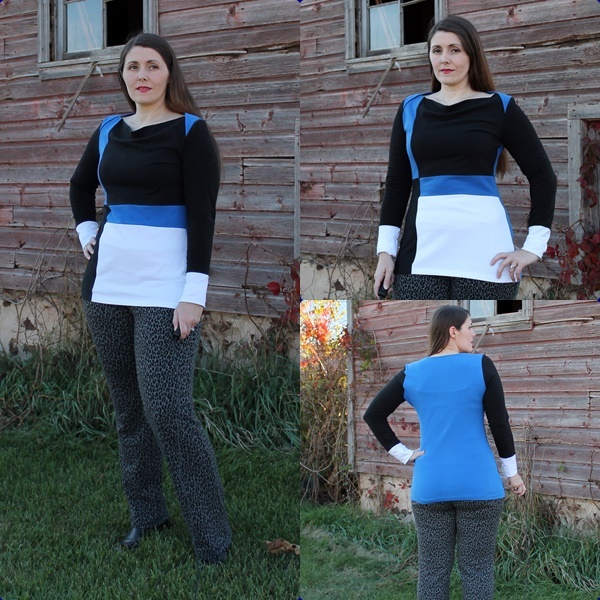 I didn't initially plan this top for this sew along, but it was made fully in the time frame. Fabricista Fashion Challenge -- Final Challenge: What They Made! 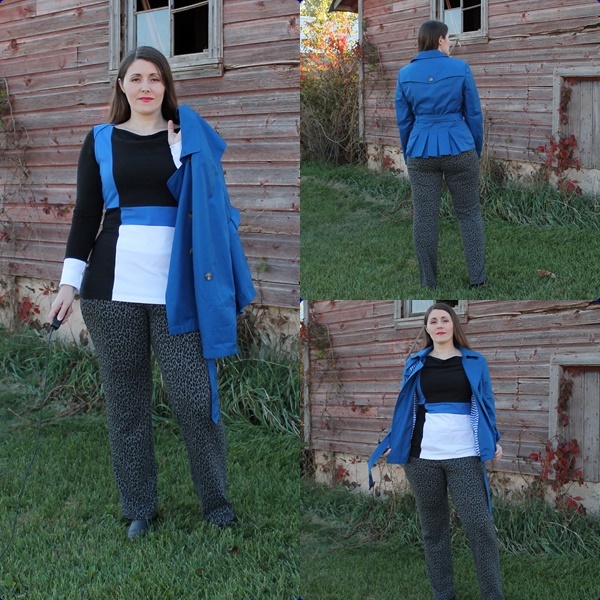 This is the last and final week of the Fabricista Fashion Challenge! I have had a lot of fun seeing what everyone has come up with in every challenge-- it is so inspiring! I'm sure these ladies are excited to have made it this far but also looking forward to being finished. This challenge is a lot of work! Everyone wins a prize this week, but the grand prize winner receives $25 a month for one year to spend on fabric, plus be a Fabricista blogger for 6 months writing guest posts for our blog. (A $300 value with media exposure.) You will also receive a Julie's Picks Membership. This week's judges are Melissa Watson from Palmer/Pletsch and Sharon Blair from Portland Sewing. You can read their bios HERE. Let's see what the contestants made. 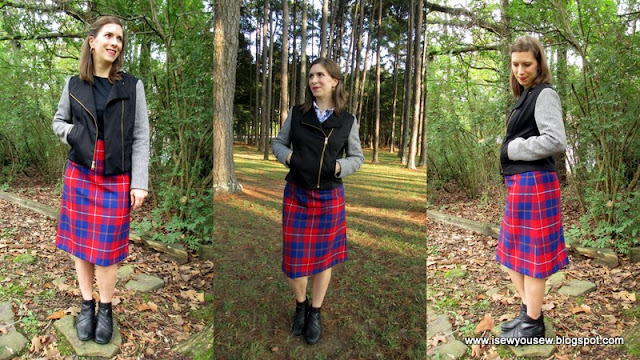 I love my plaid wool skirt made last fall from thrifted/reclaimed wool. However I often found that the one coordinating top that I had was either at the dry cleaners or too warm to wear. So my lovely wool skirt has spent too many days lingering in the closet when it could be a major player in my fall wardrobe. I also had the feeling that the jackets I tried to pair with the skirt were either too casual or too long and covered up my beautiful plaid. In order to better fit my wool skirt into my wardrobe rotation I decided to make a coordinating top and jacket. 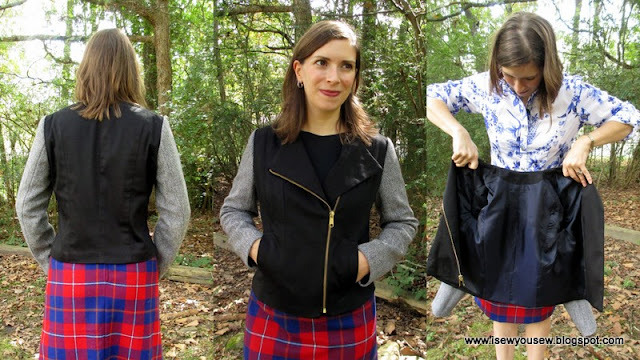 Butterick 6169 seemed like a great pick for a jacket to pair with my plaid skirt. Maybe it makes me think of 90's grunge and that harkens back to my high school days, but I really wanted to see what the two would look like together. 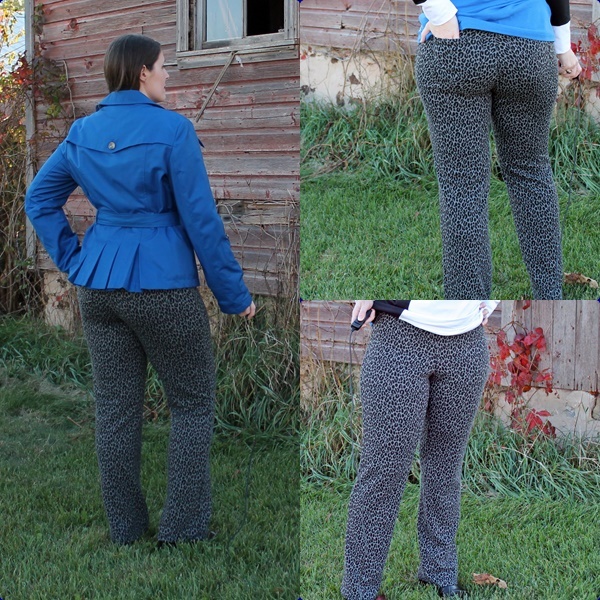 I love the combination of the two pieces and wanted my jacket to have a little twist to it, so I used a herringbone tweed wool for the sleeves and a black sateen with a little stretch for the body of the jacket. For the lining I used a dark navy bemberg rayon from my stash. I was a little nervous that the black stretch satin would stretch out during construction so I used strips of fusible knit interfacing to stabilize the seams. In this case I think it might have puckered my seams slightly- so it was the choice between stretched out seams or slightly puckered seams! I also stabilized the wool tweed with the same interfacing and it worked great! Wool is so warm and it definitely makes the sleeves cozy. I wanted to reinforce/stabilize the sleeve caps of the sleeves so I used thick red fleece remnants to fill out the sleeve caps. I referenced the tutorial on the Lisette site to figure out how to do this. She uses quilt batting, but the fleece I used is pretty close in texture to batting. The fit of this jacket is a bit tricky but thanks to the princess seams it is completely manageable. The tricky bit is that the jacket is meant to be closer fitting and I find that to be a balancing act since I want to (obviously) wear the jacket over a long sleeve top- so there has to be a bit of extra room. 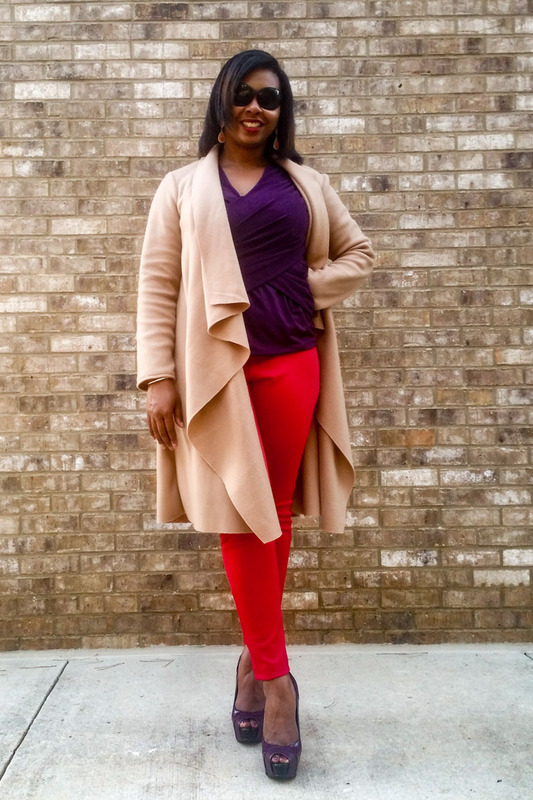 I tried the shell of this jacket on numerous, numerous times trying to strike the perfect balance between fitted and roomy. I ended up taking the outer shoulder princess seams in by 1/2 inch each to accommodate my slightly narrow shoulders. I also made sure to let the princess seaming out in the bottom back part of the jacket to make room for my bum. I took the rest of the back seams in by approximately 1/4 inch each. For reference, I started with a size 10 which is usually just right for my bustline. I also took the side seams in 1/4 inch each. The length of the jacket was just right for me so I left it alone. The sleeves were a bit too long so I ended up taking off 3/4 inch from them. I didn't combine the lining and jacket as per the included instructions but used this tutorial from Grainline Studio. I feel that all the small changes made the fit of the jacket were just right for my frame and I will be able to wear long sleeves and dresses under the jacket very comfortably. Nothing screams "fall" to me like plaids and I love wearing wool plaids in the colder seasons, I'm thrilled that I now have the perfect jacket to wear with my skirt. Also when I wear my new jacket with my plaid skirt I really feel like I'm on a time warp to 90's grunge but I am completely fine with that! I liked the early 90's! I think the jacket gives the skirt a little bit of edge instead of the usual preppy feeling I have when wearing it- I love options for styling! 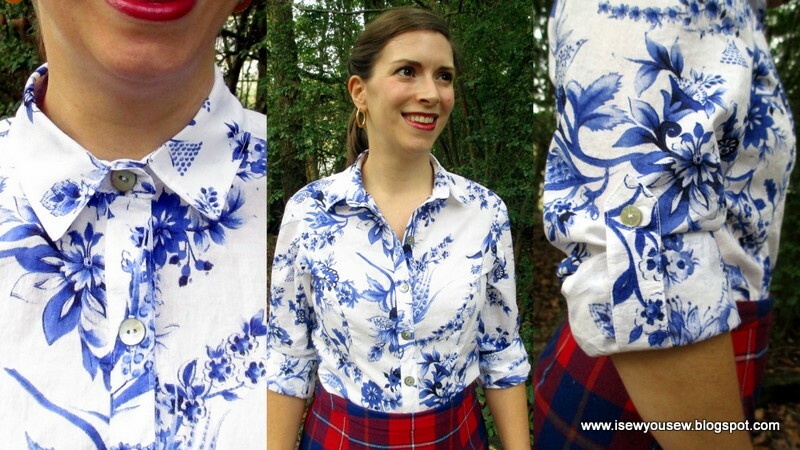 I love print mixing but don't always take the time to try it, so this challenge was perfect since it pushed me into finding a print that would work with my plaid skirt. I loved this pairing and really wanted to get a similar look so I combed my local fabric store and found this cotton voile and knew it would be perfect. I love cotton voile for button-down shirts. Butterick 5526 was almost exactly what I was looking for when trying to come up with the perfect top for this skirt. I say "almost exactly" because I really took issue with the collar. Can I say ugh!! I cut the collar and considered using the mandarin collar option but when I stitched it on the shirt it looked awful. So I decided to compare the Butterick collar and collar stand with the Grainline Archer collar and collar stand that I knew I liked. The drafting of the two collars is very different- both the collar and collar stand of the Archer are significantly smaller than the Butterick pattern. I ended up Franken-patterning the Archer collar onto the Butterick pattern and it worked perfectly. This was a moment when ripping out a completed collar was totally worth it. I know the original Butterick collar would have completely overwhelmed my slightly narrow shoulders, but the Grainline Archer collar is the perfect scale. 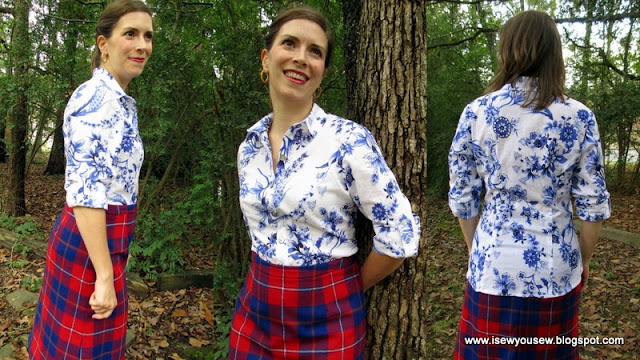 I love the princess seaming on this pattern for two reasons, the first being that I feel the slimmer lines of the princess seams help the shirt tuck into the skirt more smoothly rather than billowing out like other button-down shirts. I can't stand the bunchiness that happens under a skirt when a top is tucked into it! The other reason being that princess seams work in your favor if you usually grade between two sizes in bust and waist. I started out with my usual size 10 bust and let the seaming out for my waist and hip area since I normally grade those to around a size 12. I added sleeve tabs to this top since I often wear my sleeves rolled up and used pearlized shell buttons from my stash. I really took my time in constructing this top, I wanted to wear it with pride and I do! I serged all the seams to finish them and everything feels just perfect with the fit. It is soooo satisfying to wear a handmade garment with pride and know that the styling and fit is exactly to your liking. 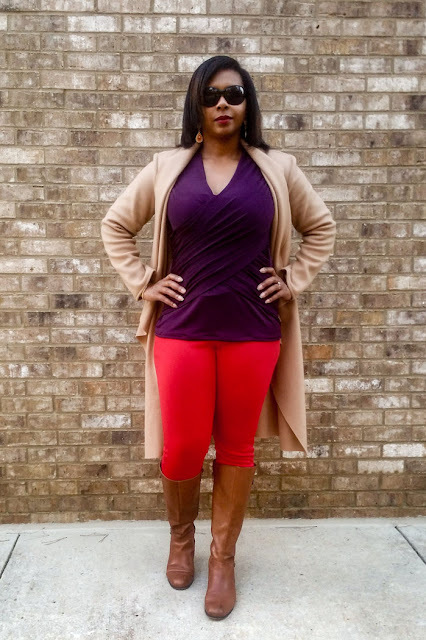 And I love the combination of these two pieces, I can see myself reaching for this pairing over and over, in fact my co-workers will probably tire of me wearing them this winter! I'm also pretty excited that all three of these pieces play together nicely and so can be worn all at once. 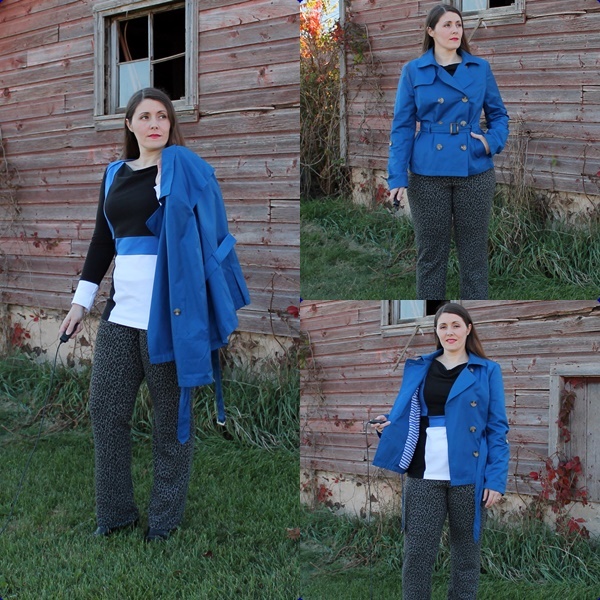 I have had so much fun during this challenge, coordinating fabrics, thinking outside the box and sewing pieces that I will grab over and over with my skirt. A few years ago my Mom gave me this amazing jacket. It is my favorite color and I was so excited. Then it sat in my closet all this time because I felt I never had anything to wear with it. Sure I could have worn it with a pair of jeans and a top, but my closet is full of t-shirts and yoga pants and I currently do not have any jeans that fit me (though I hope to make a pair soon). So this jacket was the perfect item for this last challenge. The pants were the hardest for me to decide upon. I tried 3 different patterns before tracing off a RTW pair that I borrowed from my Mom (thanks Mom!). I had issues with the other patterns in getting the crotch curve and thigh area just right for my pear shape. They were all close, but not close enough for this last challenge. So after 4 muslins (1 of each pattern, and the RTW trace off), I was happy enough to set off to buy my final fabric. However, I found that the one I had my mind on was not stretchy enough. I’ll admit, I was a bit crushed. After some thought, I found this animal print fabric in the Ponte section. I wasn’t sold on it at first but after I sewed the pants and put them on, I am sold now! The fabric is so soft but heavy enough for pants. I am very happy and comfortable in them. I know it is hard to see the details with the print, but there is a mock fly and fake front pockets. I didn’t want the bulk of any pockets in the front. There are pockets in the back as well as a yoke. 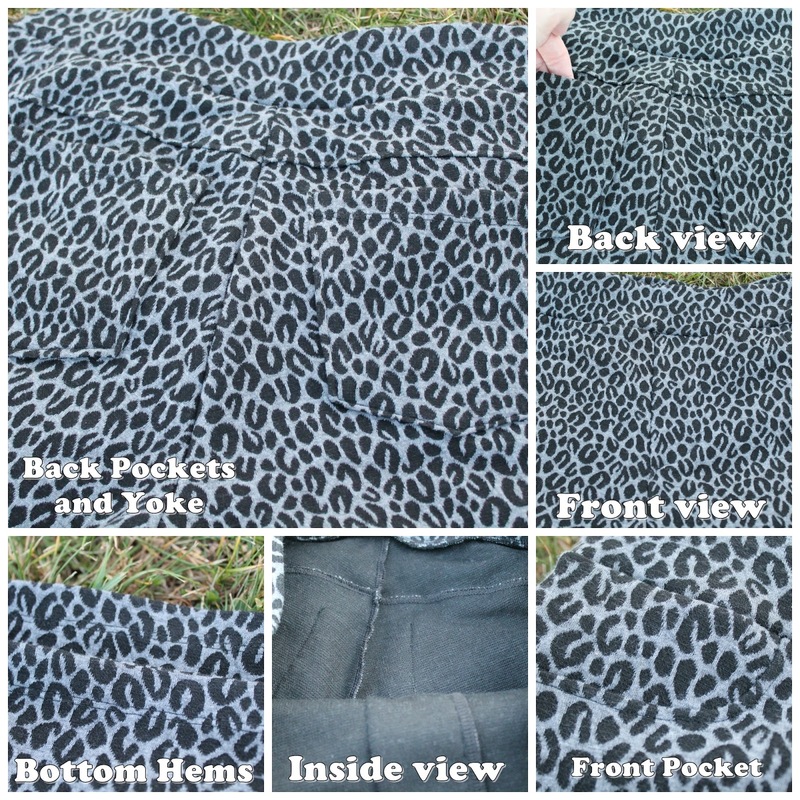 The waistband has elastic encased and this is a pull on pant. All seams are serged. Topstitching was done with my cover stitch. These are one of the most comfortable pair of pants I own now. 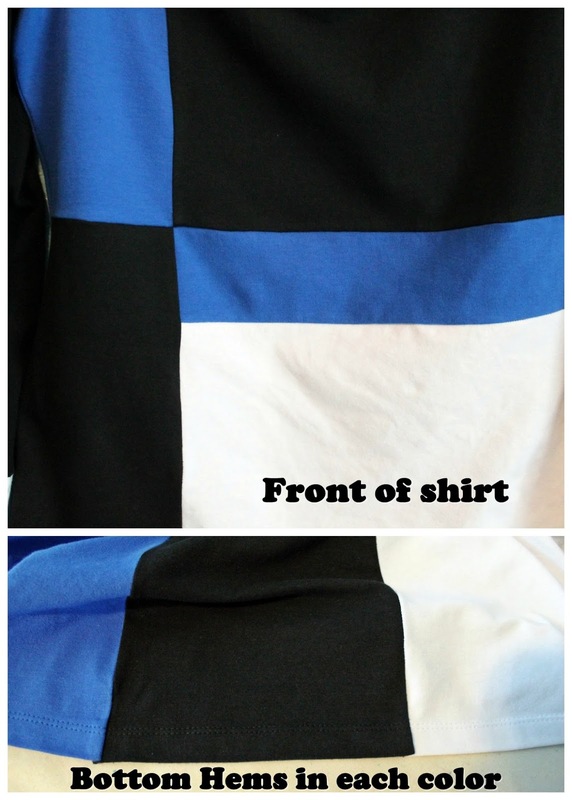 I wanted to make this color block top for awhile now so I was set on making it to work with the jacket. This is a BurdaStyle Pattern (10/2014 #103). The top is an envelope-type in that the back comes over to the front at the shoulders; it also has a slight cowl. It was time consuming to trace all the pieces, cut each color, and sew them together, but it was worth the trouble. I completed a ½” sway back adjustment, and a 1” full upper arm adjustment. I used a size 38 for the shoulders/high bust, a 40 for the bust/waist and graded out to a 48 for the hips. I was careful to match my seams so that everything would line up on point. 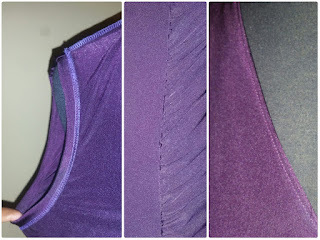 I cover-stitched each color hem separately before serging the shirt together. I even switched out serger thread in the middle of a seam where the top goes from black to white because I did not want the threads showing to the front side. I absolutely love this top; it is very much my style. I also love that it pulls the jacket and pants together into an outfit. I'm happy that they can be worn together, but also that they can be worn with other things in my closet. This is something I can wear that is dressier than my tees and yoga pants, but still very comfortable. I can't believe this is my FINAL challenge entry! These last 5 weeks have truly been a challenge but also very rewarding. I'm so thankful and humbled to have made it to the Top Three. All 6 bloggers are very talented ladies! OK, Let's get to it! The final challenge was to create a 3 piece wardrobe based around a hardly worn item from your closet (RTW or handsewn). The instructions were to sew two other pieces that would make you to wear that item more. 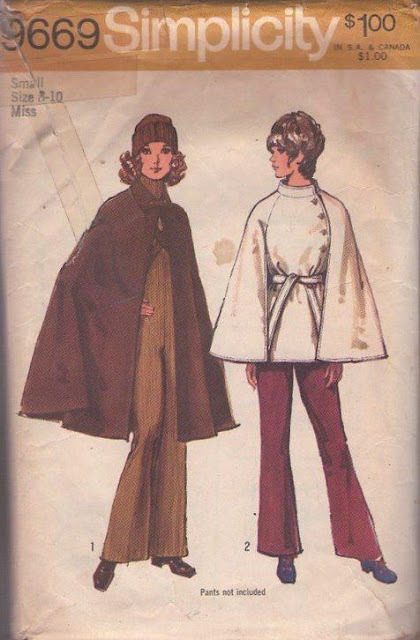 The only stipulation was that you couldn't make two of the same item, for example if you selected a shirt you couldn't make two skirts or if you selected pants you couldn't sew two shirts. Despite my very full closet my first thought was "I don't have any clothes I hardly wear" because I really try to wear most of the items I buy/make and purge the ones I don't each season. 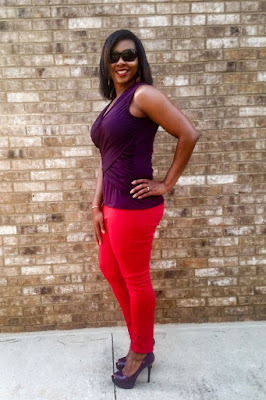 Still I had to be honest when I came upon these red ponte fitted ankle pants and say "I've only worn these a handful of times". I love these pants because they are my first handmade pair (with the exception of joggers) so it would be great to wear them more. These are a copy of a pair of RTW pants from Target. I deconstructed the pants and tracing them to make a pattern. These are seldom worn because I always wear them the same way, with a black shirt and black shoes, which is rather boring. I made the pants in red because I love red but after making them I was at a loss for what to pair them with, hence I went with the safe bet basic black. I tried to think outside the box of the safe neutrals, black and white. I wanted to pair the red with something bold and at first I thought yellow! 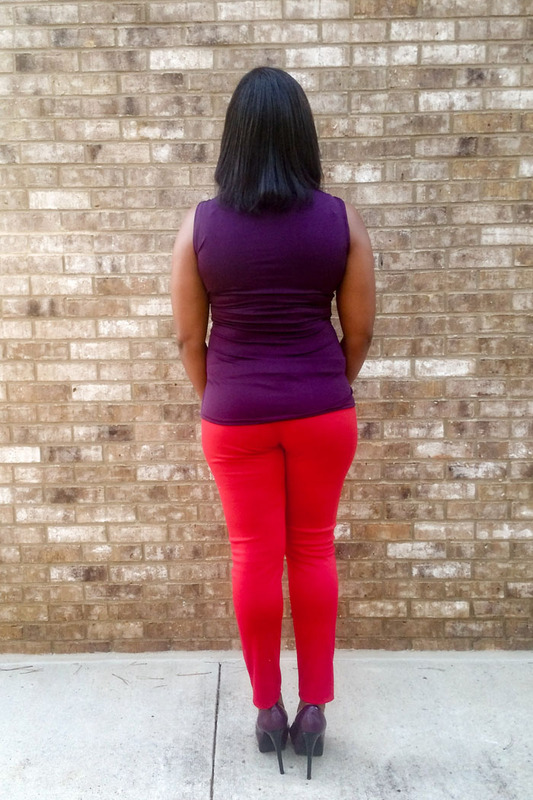 However my husband said I would look like ketchup and a mustard, which I would argue go together just fine, but I didn't want to evoke the thought of a cookout. 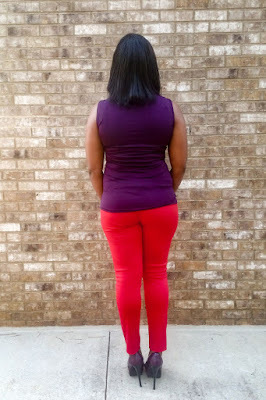 Then it hit me to pair the red pants with purple, my other favorite color. 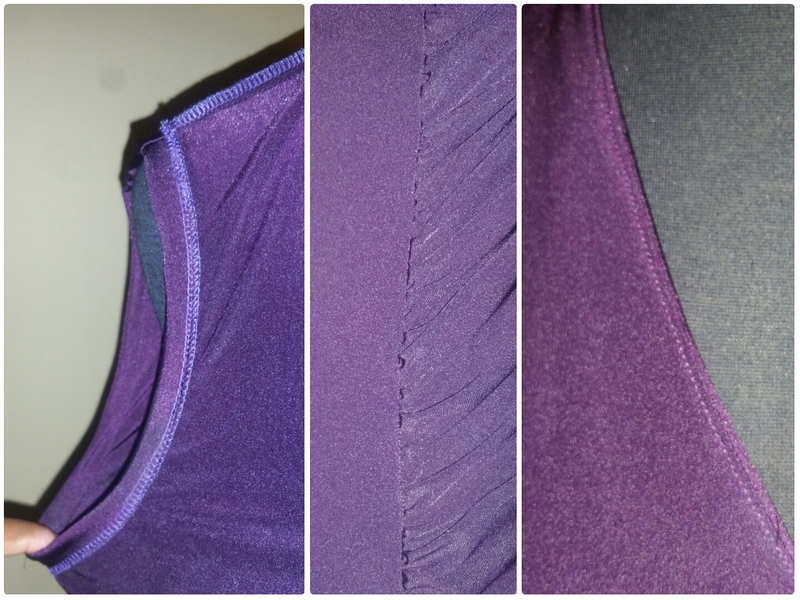 So I decided to sew up a purple top, but that left me with one more piece to make. 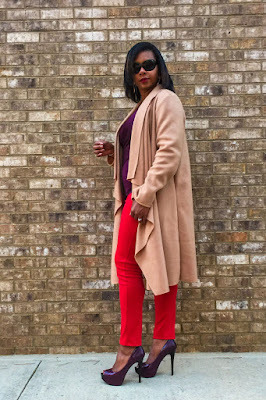 Purple and red seemed like a fall color palette to me and I felt camel was a great fall color that wouldn't overpower the two bold colors. 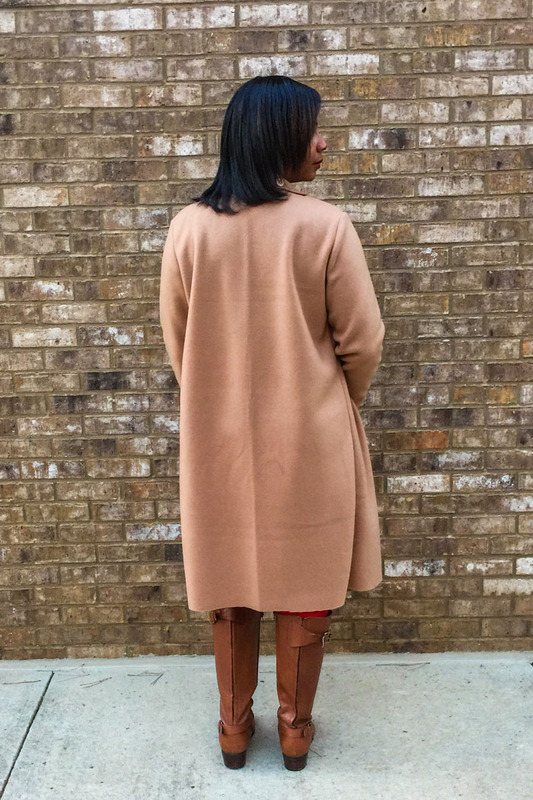 With that I decided a camel coat would transition the other two pieces right into the fall season. I chose McCalls 7249 for the top because who doesn't love gathers. Gathers are always good in my book for camouflaging your least favorite areas, which for me is my midsection. 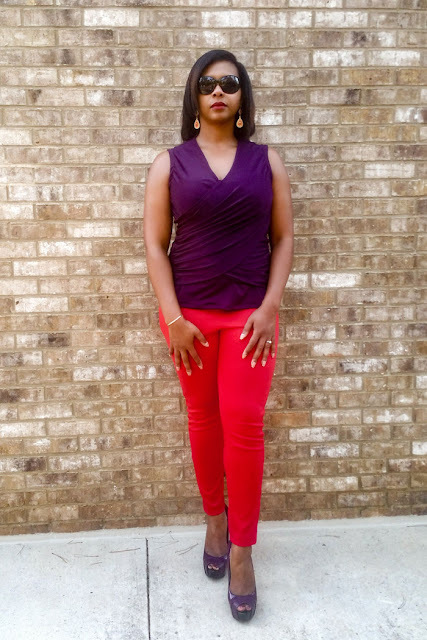 I selected View A, the sleeveless variation, even though the cooler weather is settling in because I am hot natured and love sleeveless shirts for layering even in fall and winter. 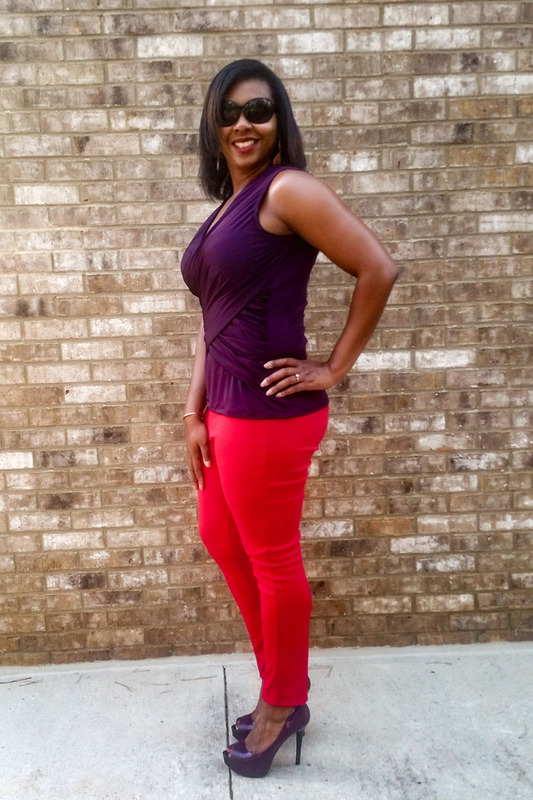 Thankfully I had this rich purple ITY in my stash that was a perfect, bold complement to my red pants. The pattern is described as a close-fitting, pullover top with gathered front overlay and narrow stitched hems. This pattern had three pattern pieces, finished edges, self facings on the overlays and understitching at the neckline. I finished all of my seams on my serger for a clean interior finish. 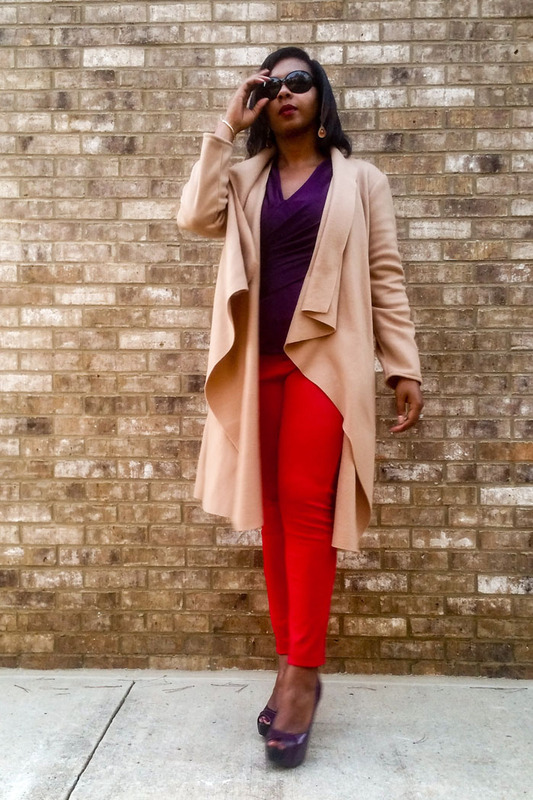 For my second piece, I envisioned a coat to take this simple top and pants for a simple combo into a pulled together "look". Something not too heavy and with some flare. Butterick 6244 came to mind as it is a simple silhouette that adds drama with its draped collar. 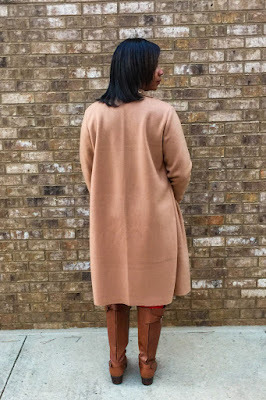 I love the length of this coat! I had a tough time finding the right fabric for this project. The pattern calls for double faced wool and unfortunately I couldn't find any camel wool locally. So I decided that fleece would be a great alternative that would give me the felted texture of wool while being both super comfy and warm. This was my first time attempting flat felled seams that were called for at the center back and shoulder seams. I really like the finished look it gives the inside of the coat and I will definitely be using this technique in the future. I look forward to using this seam on my next lighter weight fabric project as I'm not sure that fleece was the best material for a flat felled seam due to it's thickness. I hemmed the sleeves but decided to leave the collar and bottom hem unfinished. 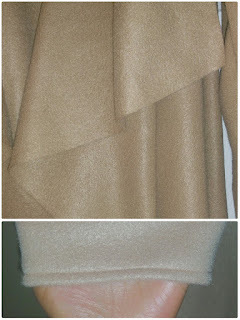 Fleece is pretty thick and I felt a narrow hem would negatively affect the collar drape by weighing it down. 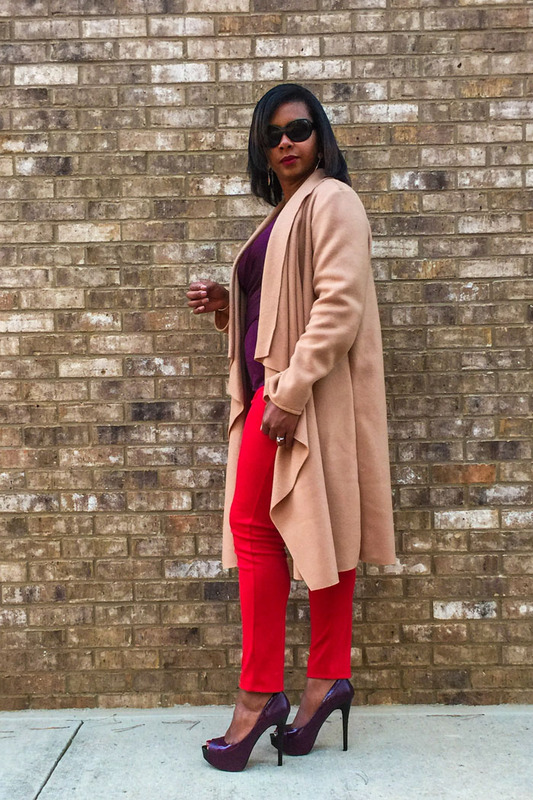 I am definitely looking to forward to wearing my red ponte pants with my two new pieces either to work or out on the town. 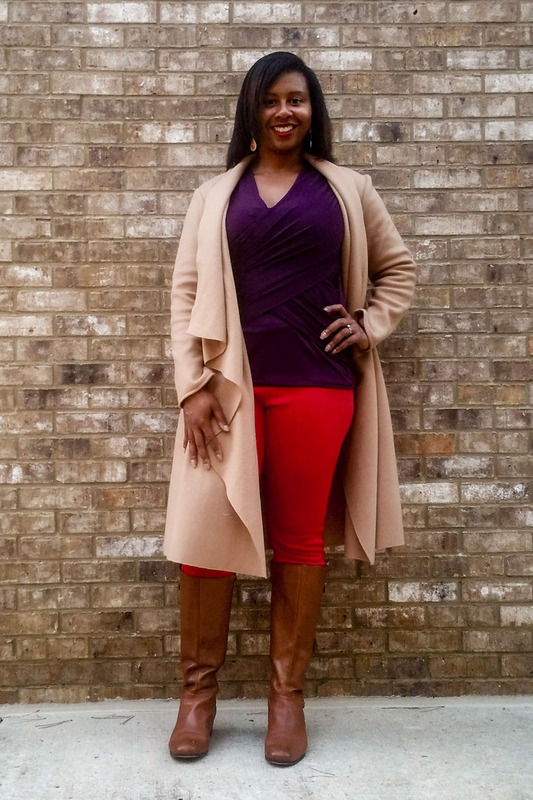 I've paired all three pieces with my purple BCBG peep toe pumps which I think dresses it up a notch and with a pair of my favorite boots give the look a more casual feel. When I remove the coat I love the bold juxtaposition of the regal purple and vibrant red.. I'm glad this challenge was presented because it has prompted me to be BOLD and reevaluate all the items in my closet. Vote for your favorite 3-piece wardrobe and who you think should win the Fabricista Fashion Challenge 3. Reader Participation! Sew along with the challenges! Use #fabricistafashionchallengereader to share a photo of your finished projects on Facebook, Instagram or Twitter. You can also email me a photo of your finished projects - fabricmartblog@gmail.com. Submissions are due by Oct 15 at 11:59pm. We will choose one winner at random to win a prize. This week's prize is a notion prize pack. New Patterns Available at Fabric Mart!